You’ve spent time in the kitchen preparing a lovely dinner for the family. 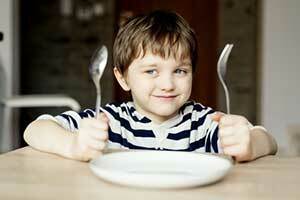 You set aside your child’s portion and, depending on what age they are, you mush it up or cut it into small chunks. Lo and behold, the dish falls to the floor and shatters while you’re juggling the meal with the nearly inevitable complaints that are sure to arise. This is a regular occurrence in any household with children. An excited child might even accidentally tip over their plate or bowl while digging their hands in and feeding themselves by hand. Any parent who has experienced this will know that using unbreakable dinnerware is an absolute must for young children. No doubt if you peeked into the cupboards of families across the US, there would be stacks of plastic dishes or some other type of unbreakable dinnerware. Plastic is the most common choice, but as parents in modern times become more aware of the potential dangers of plastics in the household, alternatives are becoming more popular. 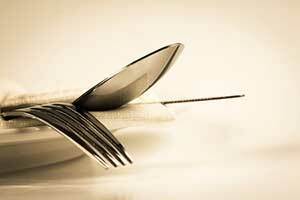 Stainless steel and melamine are two types of dinnerware that are often cited as unbreakable. But aside from being unbreakable, what are the pros and cons of these materials? Stainless steel is an alloy of iron that also contains some chromium. The chromium is what makes stainless steel stainless: it provides a protective oxide layer on the surface of the steel. This makes the steel compound resistant to corrosion. Stainless steel dinnerware has many advantages. First, it a tough and durable material. It doesn’t chip, like porcelain or glass. It doesn’t rust, like non-stainless metals. It also doesn’t get stained very easily, either. Because of its resistance to dents and scratches, it is incredibly difficult to destroy and will last you many years. It’s no wonder that stainless steel is the material of choice for professional chefs. Stainless steel does not leach into the food we eat, which is great for two reasons: it’s perfectly safe, and it doesn’t impair the flavor of the food. Unbreakable stainless steel dinnerware will often have a non-stick or protective coating, which means it won’t flake off into your dinner. Additionally, stainless steel is an environmentally friendly choice as there is no risk of it containing some of the harmful chemicals found in plastics, including BPA. In order to present an unbiased review of the various types of dinnerware, it’s appropriate to consider the cons of stainless steel unbreakable dinnerware. First of all, you can’t microwave stainless steel, so if you’re eating leftovers you need to transfer it to a microwaveable dish before serving. This can add to the amount of dishes you have to wash or put in the dishwasher. However, that’s not a really serious disadvantage. The other main con with regards to stainless steel is its price. The better quality the stainless steel is, the more expensive it will be. It is also generally more expensive than melamine. One final significant disadvantage of using stainless steel is that if it does get a stubborn stain on it, it can be difficult to clean. This generally doesn’t apply to dinnerware, however. It’s stainless steel cookware that can become very difficult to clean if food gets stuck to it while cooking. Therefore, if you’re willing to spend a bit more on dinnerware for your child, stainless steel dinnerware is a perfectly safe and durable option. Melamine is a white crystalline chemical that is rich in nitrogen, flame retardant, and organic. In some ways, melamine is the perfect choice for unbreakable dinnerware for children. It is cheap to buy, comes in bold and fun colors, and is almost unbreakable. However, if it is smashed hard enough, it can chip around the edges. On the face of it, what more could a parent want from dinnerware they’re going to feed their children with. However, as you will see, there are downsides to using this type of plastic material. The importance of eco-friendly products cannot be underestimated, and melamine is a long way from being a friend to the environment. In the years 2007 and 2008, melamine received a lot of negative press when animals and infants both started getting sick. The link that became apparent was a high level of melamine found in the dog’s food and the baby’s formula. One of the results of this catastrophe was the largest ever recorded recall of pet food. This media frenzy highlighted the potential dangers of the material. Despite this reality, melamine is still commonly found in a lot of products around the house. Its main use is in the manufacture of plastics, which attests to its wide availability. As well as dishware, it can also be used to make countertops, cabinets, and even tiles and whiteboards. Can you imagine your child eating from a dish made from the same manufacturing process as a whiteboard? When you compare melamine to stainless steel, it’s easy to see which material is safer for kid’s dinnerware. Stainless steel is not reactive when certain foods come into contact with it, while melamine is. For example, if you put acidic foods like citrus fruit into a melamine dish, it reacts in much the same way as if you heated it. 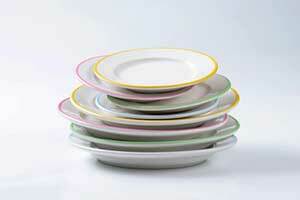 Exposing melamine to heat or certain reactive foods will cause it to react and leach into the food. No parent wants their child eating chemicals for dinner, so once you take this into account, it’s difficult to promote the use of melamine as a form of unbreakable dinnerware. It should be noted that even the government is cautious about the use of melamine. The FDA warns that a melamine dish should never be put in the oven or microwave, or exposed to high temperatures, as the heat is the main factor that causes it to leach into food. FDA guidelines state that it is safe if used under these conditions, but when you consider the fact that six babies in China actually died from consuming melamine, why would you take the risk?